Bears Mailbag - Who Makes The Final Roster? What About EDGE Help? Bears Mailbag – Who Makes The Final Roster? What About EDGE Help? After the NFL Draft, there’s usually a pretty big lull in activity until training camp. There may be a small flurry of signings with regards to the secondary free agent market, but for the most part, roster moves are set until cuts are made following training camp and the preseason. So in order to satisfy our cravings for football all year round, we look to see if we can analyze anything from rookie minicamps. The Chicago Bears just concluded theirs, and while rookies playing in shorts don’t tell us a whole lot, it’s fun to discuss it and anything related to it just to pass the time until football is back. With that, let’s reach into this week’s Bears Mailbag. Thanks to everyone who submitted questions — as always, I appreciate the participation! Traing camp battles. Who makes the 53 man roster. What undrafted free agent can make the roster. It’s a bit early to discuss 53-man rosters. So much can change between now and when rosters need to be finalized: Trades, secondary free agent market signings, other roster cuts that are brought in, waiver claims, and (god forbid) injuries. That being said, there are plenty of intriguing battles set to take place during training camp. The number one position is EDGE rusher, where the Bears need a TON of help and competitors to show that they can play. The reality is Chicago has too few proven bodies and too many injury concerns regarding the proven bodies. Leonard Floyd, their best OLB, is coming off a knee injury that ended his season. Aaron Lynch, signed away from San Francisco, also has an injury history. Their sixth round pick, Kylie Fitts, has talent and speed but he also battled lots of injuries in college — one of the main reasons he didn’t go higher. Sam Acho is currently their fourth OLB … and the Bears can’t be counting on guys like Acho, who is a great teammate and decent depth, but not a pass rusher. Look for the Bears to add more bodies before camp and for someone (or two) to win a job who is not yet on the roster. Other position battles will occur at depth spots. The Bears have brought in several intriguing undrafted cornerbacks to compete, such as Kevin Toliver and Michael Joseph. Ryan Nall was brought in to compete at RB, and could be battling Benny Cunningham and Taquan Mizzell for the third (or fourth) RB spot. The offensive line depth battles figure to be interesting as well. One thing is for certain — despite the massive improvements the Bears have made to their roster, the level of competition this year during camp figures to be huge. And given the fact that Matt Nagy recently reiterated that he will give UDFAs every opportunity to showcase their game, you can expect quite a few of them to make an impression and perhaps make the team. A few intriguing names to keep an eye on that I think have a good chance to stick on the final roster: Toliver, Joseph, OL Dejon Allen, and EDGE Elijah Norris. A couple of names that I would expect to at least make the practice squad who have the potential to contribute later in the year or in future years: WR Matt Fleming, DB Tyrin Holloway, and OL Jeremi Hall. Stay tuned: It’s going to be a fun July and August. Thanks for the double dip! Appreciate the participation. Javon Wims is an intriguing player. 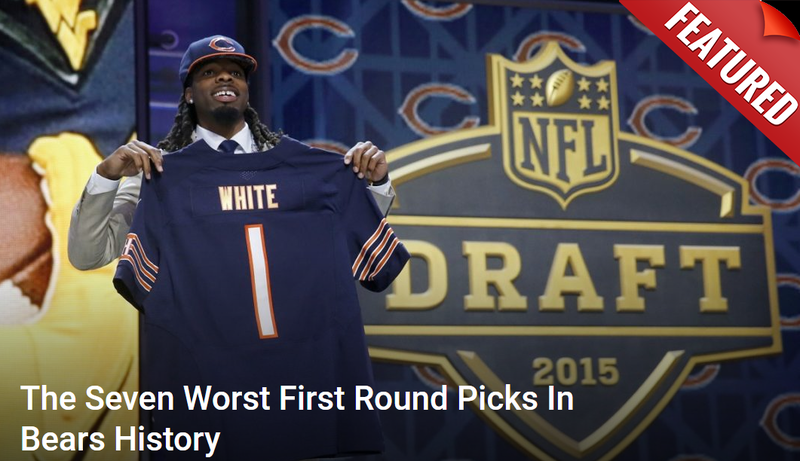 I had not watched any film on him before the draft, but after the Bears took him in the seventh round, I went back and checked him out. The dude can play. He didn’t have too many opportunities in college, but he’s shown an ability to make plays, and especially win jump balls, which is always a plus. To start out, I’d imagine that Wims would make the biggest impact in the red zone. His issue, however, is that he has to unseat quite a few players on the depth chart to make the roster, let alone play. Allen Robinson, Taylor Gabriel, Anthony Miller, and Kevin White are locks. I would assume that Bennie Fowler and Josh Bellamy (huge special teams value) will make the team as well. With six receivers in tow, that leaves Marlon Brown, Wims, and some of the other UDFAs the Bears have signed all figure to compete for either a seventh roster spot, or a practice squad spot. Wims has game, and I expect him to make the roster in some way, given that he was a draft pick. Whether that’s enough for him to find his way onto the field remains to be seen. Is this the year that Adrian Amos breaks out and starts earning everyone's respect? I've always been a fan, but even after his great year last year, a lot of people("experts" included) still wanted us to draft Fitzpatrick. It’s interesting. Pro Football Focus (PFF) graded Adrian Amos as one of the three best safeties in the entire league last year. After taking over for the injured Quintin Demps, Amos took a big step from the year before (that led to his benching for Demps in the first place) to play well and form a relatively reliable safety tandem with rookie Eddie Jackson. However, I think it’s telling that the Bears haven’t worked to lock up Amos despite a relatively strong year (at least, there are no rumors talking about it). If they really thought that Amos was as good as PFF graded him, you can bet that we’d have heard some rumors about extension talks taking place. But since we haven’t, I’m not so sure we will. If Amos follows up 2017 with a strong 2018, then we may see Ryan Pace work to lock him up. But at this stage, I don’t know if that’ll happen. As I referenced above, EDGE rusher remains the Bears’ biggest need. Despite a clear need, they did not address the position during the draft (which, while it’s hard to swallow, I really commend them for for sticking to their guns regarding drafting the best player available). They brought in one UDFA, Elijah Norris, who has some potential. But then they released LB Howard Jones this past weekend, who spent some time with the club last year, further depleting their depth. Yes, that raises questions. But trust me, if we as fans see the issue, you can guarantee that Ryan Pace sees the issue, too. Leonard Floyd needs to stay healthy and take that next step into stardom this year. Aaron Lynch needs to recreate the magic he had in San Francisco under Vic Fangio, when he broke out with six sacks. Kylie Fitts, their sixth round pick, also needs to stay healthy and develop his talent under Fangio. And after that, the Bears need real depth that can contribute. Right now they don’t have much, especially if Roy Robertson-Harris stays at defensive end. SM’s Bears expert, Erik Lambert, wrote this article some time back regarding different avenues the Bears can take to fix the EDGE depth on this roster, which I’m linking you to. The easy fixes are to sign already available veteran help, such as Connor Barwin (my preference) and/or Lamarr Houston. I had my eye on Chris McCain, but he recently signed with Indianapolis. On the trade market, Shane Ray and Shaquil Barrett figure to be available now that Denver has switched to a 4-3 base front. But it’s unclear what kind of draft capital that would cost. The final avenue remaining is waiting for roster cuts after the preseason. There are always surprise players available in July or August due to cuts, whether it be due to teams hoping to stash them on the practice squad, or just plain old cap casualties. It’ll be interesting to follow that. All I can say for now is: The EDGE issue is clear, and if it’s clear to us, it’s clear to the front office. Trust that Ryan Pace is working all the avenues and channels he can to improve that part of the roster. We’ll see where we are in the coming months. I expect a name or two to be added, and hopefully one of the undrafted guys will step up and show they can play.